The French economy is in a grave crisis, much worse even than the sluggish growth of the OECD countries and almost as bad as Britain. In the 6 years since the beginning of the crisis the OECD economy as a whole has grown by just 4.5%. Over the same period the French economy has grown by just 1.2%. This is closer to the British economy, which was still 0.6% lower than when the recession began. The data is shown in Fig. 1 below. Supporters of the Tory government’s austerity policy have bizarrely attempted to congratulate themselves on the recovery in Britain as the following quarter finally saw the British economy exceed is previous peak. But 0.2% growth in over 6 years is the worst performance since the Great Depression. Similarly, there is an absurd attempt to portray the situation positively in Britain because it is better than the crisis in France. This is both factually incorrect (in the 2nd quarter of 2014 the French economy was 1.2% above its pre-recession peak) and meaningless. However bad the sitation in France, this would make no-one in Britain better off. 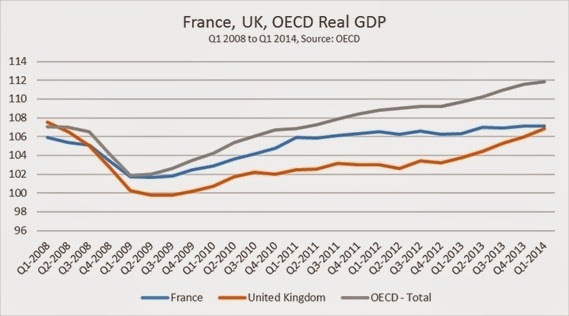 In reality, the cause of the crisis in France has the same source as the crisis in the OECD as a whole and in the British economy. It is the fall in productive investment (Gross Fixed Capital Formation) which accounts for both the severity of the initial recession and the prolonged character of the following stagnation. The various trajectories of each economy have also been determined primarily by the chages in investment (GFCF). Initially the crisis in France was much less severe than the in the OECD as a whole because the fall in investment was less sharp. 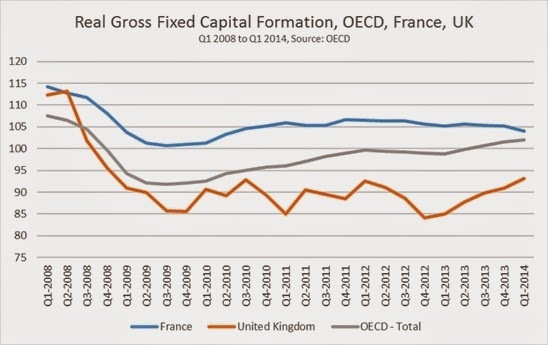 By contrast, investment fell further in Britain and the recession was sharper than in either France or the OECD. However, the recovery in French investment stalled in mid-2012 almost immediately after Hollande won the Presidential eelction and began to apply austerity policies. By contrast, OECD investment has been painfully slow to recover. But it has been on an upward trend since the 3rd quarter of 2009, which accounts for the steady crawl out of recession. In Britain the ludicrous zig-zags of government austerity policy killed off a weak recovery in 2010. But large government subsidies to reflate a housing bubble have had the effect of increasing consumption and house building from its all-time low from the end of 2012. These trends are show in Fig. 2 below. There are two key indicators of the role of the slump in investment as the cause of economic crisis in France. These are the performance of investment relative to other components of the national accounts and investment relative to its previous trend. Investment in France began falling once more when the Hollande government began implementing austerity policies. Prior to that point, the right-wing Sarkozy administration had talked about the need for austerity, but was generally keeping these measures in reserve in the hope of getting re-elected (similar to the Tory government from mid-2012 onwards, with a similar lack of success likely). 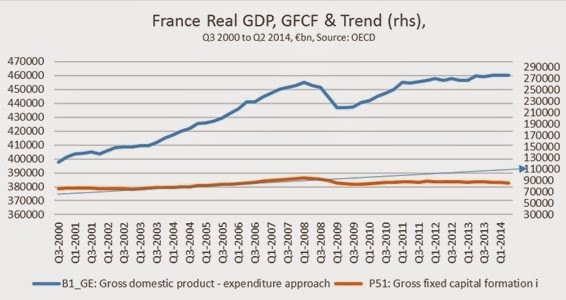 Fig.3 below shows the real performance of France’s GDP and its components from the beginning of the crisis to the 2nd quarter of 2014. In aggregate GDP is almost €21bn higher than it was in the 1st quarter of 2008. Investment (GFCF) is the only component of GDP which remains significantly below its pre-crisis level. Consumption by both the private sector and of government is higher. The problem of the French economy is not primarily a crisis of ‘aggregate demand’. It is investment, not consumption which is the brake on a genuine recovery. Private consumption is over €31bn higher and government consumption is strongest of all at over €44bn higher. This also belies the idea that austerity is aimed at reducing government spending. Pro-business parties are far less concerned about increasing government spending if this is directed towards consumption. They are opposed to an increase in government investment, which interferes with the dominant role of the private sector in the ownership of the means of production. Despite much talk about the ‘bloated state sector’ in France government investment is actually a smaller proportion of the total than in the Anglo-Saxon countries of the US and UK (just 15.3% of the total in the most recent 2011 data). Investment is now €37.5bn lower than its pre-crisis peak. It has fallen from 20.4% of GDP to 18.2%. Only net exports are also negative, but the decline is much less significant with a fall of just €2.6bn. The performance of real GDP and its components is shown below. The trend decline in investment is equally stark. Investment has fallen by 9.9% in a little over 6 years since the crisis began. In the comparable period prior to the crisis investment had expanded by 18.9%. If this prior trend growth rate of investment had been maintained, it would now be €109bn higher. This would directly add 6% to GDP even before any productivity effects from higher investment are taken into account. GDP and the investment trend are shown in the Fig. 4 below. If there were no idle resources in the economy it would be necessary to constrain consumption in order to finance investment. But that is not the case currently. In common with most OECD economies (including Britain) the profits of French firms have been recovering. In nominal terms the profit level (Gross Operating Surplus) peaked at €668bn in 2008. But after a slump in 2009 profits have turned slowly higher and finally recovered (in nominal terms, not taking account of inflation) to €674bn in 2013. But investment has continued to fall and is now €17bn lower than in 2008. The investment ratio (investment as a proportion of profits) has therefore declined. This is the culmination of a long-term trend. 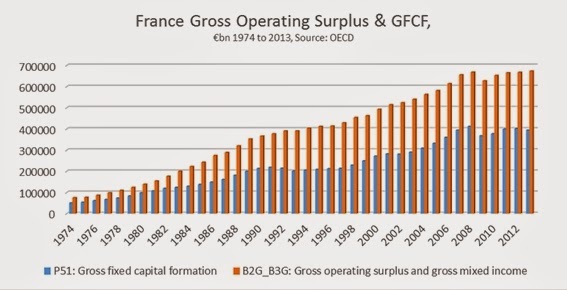 Fig.5 below shows the nominal level of profits and the investment for the French economy over the last 40 years. At the beginning of the period the investment ratio was approximately two-thirds. In 2013 investment was €395bn compared to profits of €674bn, an investment ratio of just 58.6%. Simply restoring the former investment ratio would increase the level of investment by approximately €40bn. Instead, the level of uninvested profits continues to grow. France is not in crisis because of the Euro. The main features of the crisis are the same as in Britain, which maintains its own currency. 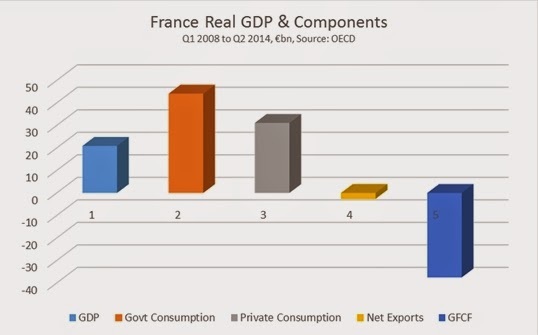 Nor is it true that the crisis of the French economy is caused by a bloated state sector. On the contrary, government investment as a proportion of total investment is now lower in France than in either the US or UK. This is actually a key part of the problem. The crisis is accounted for by the fall in investment. The private sector is on an investment strike. This is exacerbated by the cuts in the government’s own level of investment. The resources exist to resolve the crisis throught state-led investment. This can be funded by using uninvested profits of the private sector. A certain proportion of this can be done indirectly via government borrowing, especially as borrowing costs for 10 years are just 1.25%. It can also be done directly, directing the state-owned enterprises and the the commercial banks to increase investment, as well as other measures.